Another quickie update on the Front Bedroom. 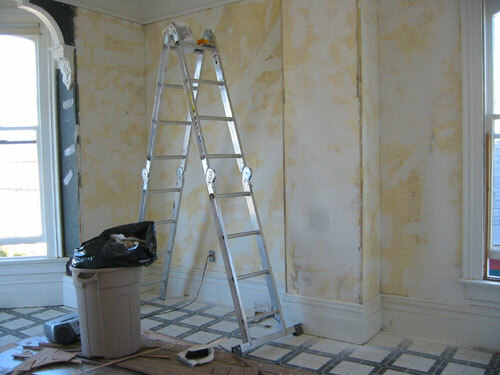 I finally (mostly) finished the plaster repairing yesterday, at least enough to start painting most of the room. I'm still building up the plaster over the fireplace hole, but that's a small area and easy to paint separately. 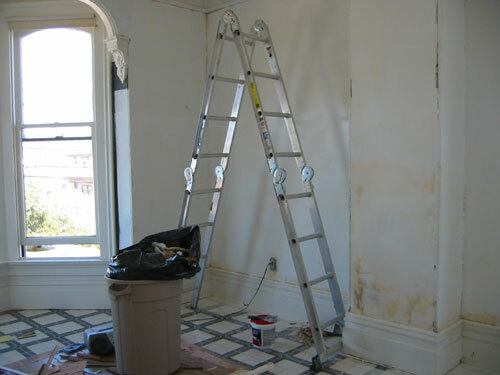 I would even have started priming if I had had, oh, a roller cover or two to do it with. Failing that, I went to the paint store this morning and bought some rollers, some primer (you can never have too much primer, I have come to realize) and some samples of paint for the room. In between meeting with contractors about the roof and the foundation, I put on the first layer of primer, which the walls sucked up like it was sugar water or something. In some places the plaster cracked under the pressure of the roller (arg). In some places, I had not yet cleaned up the dust from plaster repair, so I was avoiding making a mess of the roller. In some places I was being lazy. I'm waiting for this coat to dry, which should be about when Noel gets home. Then he's going to help me clean up all that dust, and we'll do the details and another coat of primer. I think I might go check on the plaster to see if it's dry in a few minutes, and put down another layer if it is.